My most enjoyable memories as a kid were family vacations in the beach or in the farm, in my mom's hometown province. The same goes for my husband. That is why, we agreed to plan vacations and trips as often as our time and budget permits. While out-of-town trips can be a fun experience for your kids, they're more like a somersault stunt for mommies, especially with babies and young kids. If a trip to grandma is an entire production number in itself, imagine going on a 4-day island beach getaway. 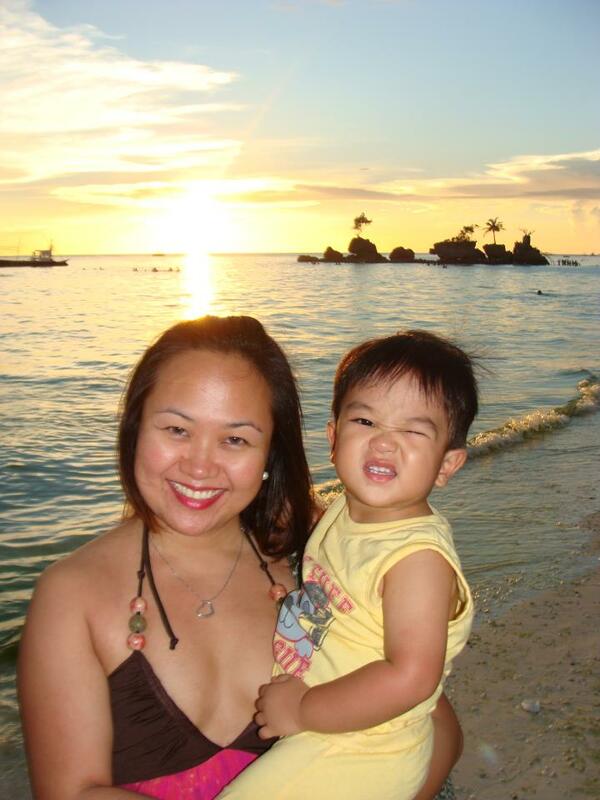 Last April, we spent our summer vacation in Boracay. When I was single, Boracay was my go-to refuge to de-stress from work, bum around and party to wee hours. It is a familiar playground, so I thought. So carrying a toddler will be no problem? Right? Besides, I've also events in Boracay when I was still in brand. I managed to mobilize an entire crew of chefs and production team. I thought I got it covered. Wrong. I was so proud to fit our house in 2 trolley bags. My mistake was...I didn’t weigh the bags. Oh no! I know I'll hear it from him when we found out our luggage was overweight by 6 pounds. Because I was smart (or maybe scared? :) I manage to rummage some stuff out (I got the books and toys out first because they are the heavy ones) and magically squeezed the excess baggage in my beach bag and took it as my carry-on luggage. Ok, so my planning skills have become quite rusty. My saving grace is deciding to bring Caleb's umbrella-type stroller because the last thing I need was a tantruming toddler. The plane ride went pretty smoothly for Caleb, who was asleep on my lap. Oh, I'm so lucky. But not quite... Just when the plane was about to land, Randy grabbed him and stood him on his lap. He started coughing and the next thing I knew, both of them were soaked in vomit. Just like any good mother, I panicked! I kinda stood there staring and forgot where the wipes are. It was a good thing the passengers were deplaning and didn’t have to deal with the foul smell. One of the flight attendants who is also a mom came to my rescue with a box of paper towels. We were the last one to get off the plane. My poor husband had to take care of 2 babies. We rushed to the carousel to catch our pre-booked transfer arrangements. Because we have not gotten over the incident, the tedious transfers (land trip, boat ride and another land trip) seemed like nothing. Unfortunately, my story does not end here. This was only the intro. Just kidding. When we got to the island, I did not know that the boutique hotel I chose did not have its own back road access. So in the mid-afternoon, we had to carry along our overweight baggage, stroller included in what seemed liked Sahara dessert. I could almost hear an argument about to blow up. But I did not. Thank God I have a very understanding husband. I felt just laying in bed and hold a pity party. How can I overlook all these things? By God's grace, I was able to control my emotions. I realized that if my husband can forgo all these things, I could as well. I had a choice of whether to make this an enjoyable experience for my family or a time to spoil that possibility by choosing to lick my wounds. I chose the latter.